Every now and then you gotta switch up your fashion flow. One day I may rock a skater mini, the next a long maxi or as in today’s post, I’m getting my business look on. I had a meeting to attend and wanted a professional yet stylish appeal. Well one could never go wrong with a classic Chanel jacket but since they are $5,000 each and don’t come in plus-sizes I opted for a similar look using the Studded Classic Boucle Jacket from Wal-Mart. This jacket comes in 3 different colors and is now marked down to only $17 from $26. I ordered mine last Wednesday and it arrived the very next day. Wal-Mart was on point with their holiday shipping. But I had to go a size up because the 2X was sold out in red at that time and now I see that all is left is a size 2X, go figure. 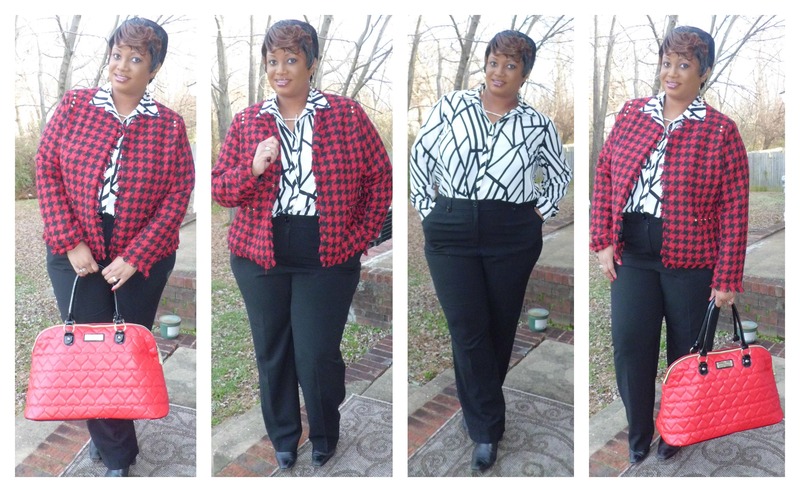 (The other colors are available in various sizes 1X-4X). Anyway the jacket has that classic Chanel look but with added gold studs on the front shoulder and pocket areas. For contrast I paired up a black and white dress shirt from Simply Be, worn before here, and the oh so comfy Full Comfort Pants in Black from Just My Size (Tall, $32.99). 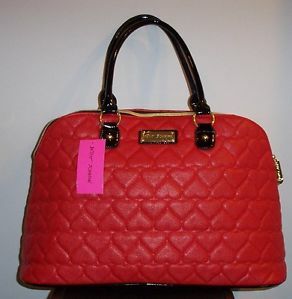 About a month ago I bought myself this Betsey Johnson ‘Be Mine’ Dome Weekender Bag as an early Christmas/Valentine’s gift from Marshall’s for only $59.99. The bag retails for $138. I just love a big bag and believe it or not, I still need more space just for my day to day needs in a purse.